And Then Sean Spicer Said What?!?! We didn’t use chemical weapons in World War II. You know, you had a, you know, someone as despicable as Hitler who didn’t even sink to using chemical weapons. So you have to if you’re Russia, ask yourself: Is this a country that you, and a regime, that you want to align yourself with? You have previously signed onto international agreements, rightfully acknowledging that the use of chemical weapons should be out of bounds by every country. Syria is a rather small country, yet it has been dominating headlines for years now and the news is never good. This week, the new coming out of Syria was particularly gruesome. The United States launched a military strike Thursday on a Syrian government target in response to the chemical weapon attack. But Did He Have the Authority to Launch the Strike? Inside the United States, it was politics as usual, Trump style. Jeff Merkley Holds the Floor for Over 15 Hours!!! Senator Jeff Merkley (D-OR) started speaking on the Senate floor around 6:45 pm Tuesday night and proceeded to speak for over 15 hours. His speech was in protest of President Donald Trump’s Supreme Court nominee, Neil Gorsuch. But Merkley couldn’t keep talking forever, even if he had unlimited endurance. Senate Majority leader Mitch McConnell (R-KY) preemptively filed a motion to end debate, known as a cloture motion, before Merkley started talking. That motion starts a clock for votes on cloture, which is one of the few things that Senate rules allow to interrupt a marathon speech like Merkley’s. As always, in Trumpland, there was more news than I could possibly cover in one column. Jeff Sessions is messing with police reform, Trump signed the bill to repeal our internet privacy laws, California passed a sanctuary state law, it ends up that Trump changed the terms of his trust, which already did not adequately address his conflicts of interest, former National Security Advisor, Susan Rice, acknowledged Tuesday that she engaged in unmasking Trump officials late in President Barack Obama’s term, but insisted it was not politically motivated, the United Arab Emirates arranged a secret meeting in January between Blackwater founder Erik Prince and a Russian close to President Vladi­mir Putin as part of an apparent effort to establish a back-channel line of communication between Moscow and President-elect Donald Trump, according to U.S., a judge ruled the Trump may have incited violence, the United Nations warned that Americans’ right to protest is in grave danger under Trump, and everybody in the Trump administration is stinking rich (which surprised no one). What the Heck Happened This Week?!?! By now you should have ALL your representatives on speed dial. 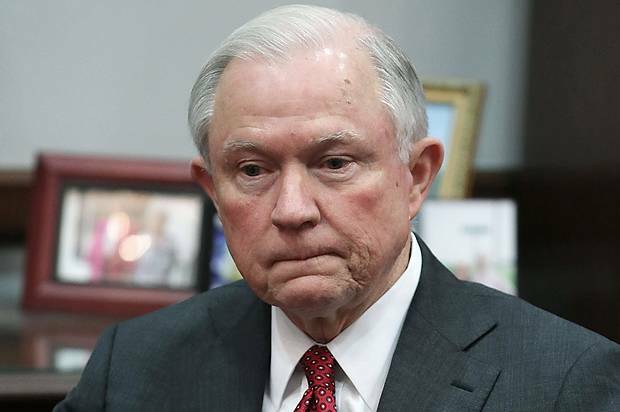 Call both your senators and congresspersons, and also call the Department of Justice, (the number is 202-353-1555) and demand they ask for AG Jeff Sessions’ resignation immediately, for lying to Congress during his confirmation hearing. We have three calls to action for you to consider. Please set an hour aside this week to stand up and fight back.